The Wizarding World is at risk of exposure. The Ministry of Magic and the International Confederation of Wizards need YOUR help! Are you looking for a beginner’s guide to Harry Potter: Wizards Unite? You’ve come to the right place. From potions and spells, to energy and Portkeys, discover everything you need to know about playing Wizards Unite for the first time. When you’re starting up Wizards Unite for the first time, you’ll have to sign in with either Google or Facebook, and then agree to their terms & conditions. After that, you’ll enter your first and last name. (This can be changed any time as many times as you would like). Then you’ll finally be able to pick your code name! (This, you are not able to change as of yet). After you pick your code name, you’ll then begin your tutorial on how to return a foundable back to where it belongs in the Wizarding World. As you return each foundable, you’ll be able to see your progress by first clicking on your registry and then adding the foundable’s image by clicking the flashing blue icon that appears. Hagrid is the foundable for the tutorial. After finishing the tutorial, you can set up your Ministry ID by clicking on the wizard silhouette at the bottom left of your screen. From there, you can change your first and last name, title, Hogwarts house, and wizarding achievements. You can also select your wand type there from Ollivanders as well! Once you hit level 6, you can choose your Profession. This is the first choice that really affects the game. You can choose from three professions in Wizards Unite. Will you choose the combat veteran, Auror? This Profession is lead by Harry Potter himself! Will you choose the team healer and support, Magizoologist? This Profession is lead by Rubeus Hagrid himself. Or, will you choose the highly adept spell casters known as the Professor? This Profession is lead by Professor Minerva McGonagall herself. Each set of Professions has their own Skill Tree in which you can add skills with scrolls. Read more about Professions on our Wiki page! Aurors are combat veterans who cast debilitating spells designed to defeat the Dark Forces. Magizoologists are healers who focus on helping their teammates. They also specialize in taking down Beasts. Professors are strong spell-casters who can use debilitating spells to take down enemies, as well as support their teammates. Professors are most effective against taking down Curiosities. While playing Wizards Unite, you will find potions and ingredients to help you progress through the game. When brewing potions, you can decrease the waiting time for each potion by 15% if you correctly guess the Master Notes. Note that Master Notes can be found HERE if you click on the potion that you want to brew. You can also find the ingredients needed to brew it. As of writing, there are currently 15 potions in game. Take note of these potions. Baruffio’s Brain Elixir unlocks at level 4, and it will boost your XP for 30 minutes as you complete Traces and Portkeys. If you want to brew one, it takes 12 hours. However, if you follow the Master Notes, you can take 15% off of its brewing time. By following the Master Notes for each potion you brew, you’ll always take 15% off of the brewing time. There are currently 57 different ingredients in the game at the time of writing. You can find ingredients in Wizards Unite by walking around your mini map and tapping on the ingredients to collect them. Of course, some ingredients will be much harder to find than others. Find the complete list of Ingredients. In order to return a Foundable to where they belong, you’ll need to accurately trace a random Glyph. The Glyph you get depends on the spell you have to use. A list of Spells, and the Glyphs you’ll be tracing can be found here! There are currently 14 spells in the game. Keep checking back as more may be added over time! Each spell is used for different Foundables. Along with Fortresses on the Wizards Unite map, you’ll also have Inns and Greenhouses. Inns allow you to refill your spell energy. These look like a vertical inn with a chimney. There’s a 5-minute cool down per collection. Greenhouses allow you to brew potions and collect potion ingredients. Note that you can also find ingredients on the ground. At the beginning, you can only have a single potion brewing at a time. At level 10, you can buy another 4 spaces for brewing. When you first start your game, you have a capacity of 75 Energy. This energy depletes with each spell you use, each Foundable you return, and each Fortress that you participate in. You can refill your Energy as mentioned above at each Inn you visit. You can opt in to buy more energy in Diagon Alley (the in-game store) for coins if you so choose. Dark Detectors are the equivalent of Lures in Pokémon GO. If you put a Dark Detector on an Inn, you’ll reveal rarer traces for 30 minutes. This allows you to potentially fill up your Registry even faster. It’s important to fill up your registry so that you can collect scrolls and unlock Skill Points for your Professions’ Skill Trees. Last but not least, Portkeys! You will find Portkeys on your map as you walk around. They require keys to open. Wizards Unite gives you one key that lasts infinitely. You have 8 spaces in your Portkey inventory. You can buy packs of silver keys from the in-game store. You can also unlock them as you level up as well. These Portkeys will take you to an iconic place in the Wizarding World once you finish walking them their respective distances, which are 2, 5, and 10km. As always, keep checking back to Wizards Unite Hub for the latest Wizards Unite news and updates! If you haven’t already, feel free to join our Discord Server for further discussion! All Wizards Unite level up experience requirements, rewards and unlocks. Currently there are only 20 levels players can reach in Wizards Unite Beta, but we expect there will be more once the game officially launches. Wizards, attention! We finally have a really good recording of how Fortresses look like in the current beta build. A player from New Zealand, called “Potato Slayer”, published a 14 minute long video that shows various aspects of Wizards Unite game play: leveling up, Inn and Glasshouse interaction, Foundable encounters, Potion brewing and finally… Fortresses! As hinted in the pre-release press materials, players progress through Fortress floors by clearing all enemies on a particular floor. Each floor requires you to spend Runestones to enter it. Apparently, Runestones of any color work and they could influence which rewards you get (speculation, don’t quote us on this, but the player used a Dark Arts Runestone to enter and received progress in both Dark Arts fragments and Challenge categories). At one point, the player has to use a Healing Potion in order to keep up with the incoming damage. Overall, the combat mechanics look much better than Pokemon GO’s tap-to-raid system, especially given that Wizards Unite are currently in beta period. We sincerely hope the combat will stay the same when the game finally goes live. Professions in Wizards Unite are class-like systems that define your overall role and gameplay style. There are three available professions each having their own unique perks and expansive skill trees: Auror, Professor and Magizoologist. Players can freely switch between professions and progress each separately from the other. Auror is a combat focused profession that specializes in dealing with dark wizards, spell casting and dealing straight out damage. Aurors are lead by the legendary Harry Potter. The official in-game description states that Aurors are combat veterans who defeat Foes by Combining their innate leadership with a litany of debilitating spells. Aurors are most effective against Dark Forces. Magizoologist is a support oriented profession that specializes in providing buffs, dealing with magical beasts and similar affair. Magizoologists are lead by Hagrid. The official in-game description states that Magizoologists focus on healing and helping their Teammates. Magizoologists are most effective against Beasts. Professor is a balanced profession, adept at dealing damage and providing various utility effects. Professors are lead by Professor McGonagall and use their deep magical knowledge to debilitate Foes while also supporting their Teammates. Professors are most effective against Curiosities. Each profession features a skill tree that can be progressed separately from the other profession. The further you progress down a tree, the more powerful abilities you unlock. In order to level up your profession’s skill tree you need tokens which can be earned from encounters, leveling up and completing other in-game challenges. Players can freely switch between professions and it is highly advised to do so in Fortresses. Fortresses require multifaceted teams to complete and it’s not expected that you will be able to complete them with a single Profession team. Witches and wizards, listen up! This is not a drill! Niantic has recently announced via both Twitter and its blog that the beta test of Harry Potter: Wizards Unite has been released to players in New Zealand. For the lucky players living in New Zealand, all one must do to obtain the beta version of Wizards Unite is go to the App Store or Google Play Store and download the app. In its blog post, Niantic reminded everyone who is not eligible for beta to sign up for updates at wizardsunite.com and wait for further updates. Some initial details about the game have come up: there are styles for your avatar corresponding with each Hogwarts house, Hagrid and Hermione seem to be story characters, and the map looks very similar to that of Pokémon GO. Players seem to have Ministry-issued badges, and they can cast spells by tracing their fingers on their screens. A big thanks to the members of our discord server for pointing us to this information and putting up some screenshots straight away! If you want to join our Wizards Unite discord community, the link is here. It’s certainly been a long wait for a beta test, and hopefully it will be worthwhile–only time will tell, but we certainly have high hopes for this magical game! What would you say if I told you that Niantic’s greatest asset isn’t that of the multi-million dollar machine we all know and love as Pokémon GO, but rather an ingenious software system that constantly learns and adapts to the world around us? This is a story about Niantic Real World Platform (NRWP), an AR system that has been in development for more than 7 years and that (almost) nobody is talking about. Niantic Labs was formed in 2010 as a an internal startup within Google, aimed at following up on their previous work in the space. With a team whose expertise was deeply entrenched in mapping, 3D modeling and map interaction, Niantic set out to create a combination of maps and games that would entice people to explore the world around them. Field Trip was a powerful recommendation engine, but a limited one as well. You see, Field Trip was powered by publications such as Zagat, Thrillist and TimeOut, rather than using app users’ provided data. Everything that Field Trip suggested was pre-picked by someone else, someone who often wasn’t native to that area. Field Trip’s recommendation engine was quickly followed up by Ingress, the first ever location-based mobile game that blended augmented reality with a mysterious science-fantasy setting. Ingress was and is the core of Niantic’s technological growth. Incidentally, Ingress is also where our story begins. Niantic launched Ingress in November 2012, backed by an intriguing mystery plot that connected the real world to the online world at last. Growing in popularity via Google’s Google+ social network, Ingress was spreading like wildfire among tech geeks and early smartphone gamers. Initially, Ingress had the same problem like Field Trip: how to populate the real world map with actual Points of Interest? Niantic tried to solve the problem by reaching into the Historical Marker Database and the map of national Post Offices, but as older players remember, it was not good – it was not good at all. You see, Niantic created most portals (Ingress POIs) using a curated data set with limited geographical reach. Niantic needed a better solution for this issue, and indeed, they delivered. On March 14 2013, Niantic released Ingress 1.21.3, the first version of Ingress that introduced Portal submissions. For the first time ever, players were able to influence the in-game map by submitting local highlights, attractions, and other unique places that represented interesting places in their area. Those places would eventually become actionable POIs inside the world of Ingress and players would be able to interact with them and further improve their gaming experience. Players raved about the feature and from this moment onward, Niantic never had to worry about collecting, scraping or buying geographical data – the players were providing it themselves by simply participating in the game play loops designed by Niantic’s ingenious developers. Ingress portal submission was released six years ago and players are still submitting large numbers of portal candidates in an effort to improve the game’s world map across the globe. Inadvertently, six years of portal submissions has provided Niantic with the world’s largest user generated map of world’s unique places, local highlights and everything else that fits Ingress Portal requirements. This data set, humbly referred to as “POI DATA”, is one of the pillars of Niantic’s Real World Platform. With POI data solved, Niantic set out to diversify and learn more about the real world in the context of AR gaming. It’s still not clear which data sets were actually used, but in the coming years Niantic grew their knowledge of cellular data, player concentration and even used OpenStreetMap to improve the map. Ingress is where the story began, but it was Pokemon GO where the Platform started shaping up as a product. Pokemon GO’s release was rocky at best, plagued with server problems, scaling challenges and 24/7 fire drills for the ops team. The game took months to stabilize, but around March 2017 Niantic was ready to start working on the Real World Platform again. It is not clear when the decision was made to make the Platform into a stand alone product, but what we know for sure is that Niantic is planning to release it to third party developers soon. As you may expect, the Real World Platform is comprised of several key areas and data sets populated and consumed by various parties. In the rest of this article, we’ll cover the fundamental parts of the Platform and explain how each of them works in the grand scheme of things. Some subsystems are smarter than others. For example, take a look at the “anti cheat security” subsystem. Niantic’s anti cheat mechanisms are powered by machine learning algorithms that gobble up all of the player action data and flag potential malicious activities for further investigation. Another notable subsystem is called “social” and it allows Niantic to segment the player base, act on player activity and push notifications down the line, usually in the form of platform specific push notifications and in-game news. Other parts of the Platform are more technical in nature. AR cloud and spatial serving allow for progressive loading of AR layer and storing special AR-specific objects in the real world. Our seasoned readers will remember that Niantic bought Escher Reality in March 2018. Escher Reality was a technology company based around providing a shared multiplayer experience in AR, but also around providing a persistent storage layer for AR objects in the real world. Want to hide a portkey in a specific locker in a public location and have it visible only to players who crack the locker’s passcode? No problem, Escher’s Niantic’s AR cloud has you covered. If you pick up Pokemon GO and put it side by side with Ingress Prime, you will notice an eerie similarity. That’s not by chance, as Niantic’s modern game clients are all based around a shared native plugin layer and follow similar design principles. Each client has access to the same high level map loading, player and account management solutions. Bundled with those are lower level libraries that were in development for years: GPS handling. authentication, caching, scheduling and cell management. Don’t believe me? Not a problem, read our Ingress Prime APK teardown for an in-depth analysis of everything shared between Pokemon GO and Ingress Prime. Unity3D powers the game engine, UI interactions, asset management and player interactions, Protobuff and RPC are used to perform server side communication. All of this applies to Pokemon GO as well. We expect that Wizards Unite will follow suite as well, if the client app is indeed developed by Niantic. If it’s not, then we’re in the wild west territory. I admit: I have been deeply impressed by Niantic’s Real World Platform for a while now. However, there are still some unanswered questions in the back of my mind. How ready is it? How do you interact with it? What languages do you need to know in order to use it? In order to answer these questions, we’ve analyzed Niantic’s recently published developer contest website. The website is basically a contest listing, but it does reveal a lot about programming languages and solutions used in Niantic’s Real World Platform. All selected teams are required to furnish their own Mac-based hardware for development. Additionally, teams must be able to provide their own mobile hardware (with built-in ARKit or ARCore support) for playtesting. Frankly speaking, this looks great from a techie’s perspective. The Real World Platform has bindings and APIs in popular languages (Java and C#), good documentation and uses a modern build system: Maven. It checks all of the relevant boxes in the world of modern software development. We hope you enjoyed this long-form article – it took us a lot of time to research and discover all of the facts and figures behind the Platform. Niantic has really built something special with the Real World Platform and it’s not surprising that Warner Bros. decided to go with them as the development studio for Harry Potter: Wizards Unite. Niantic has launched a new mini-website titled Wizards Unite Code Name Reservation, built on top of their existing official website. After claiming my username, the little dataminer inside of me couldn’t help but wonder: how does this work? Ingress reservation redirects to intel.ingress.com/hpwu, the website that actually serves the Ingress Intel Map web application. Ingress and Pokémon GO reservations are fundamentally different, but they all target the same data layer (player profiles stored in Niantic’s Real World Platform). Regardless of the method you used to login, Niantic is storing your logged in information into localStorage. Luckily for everyone involved, only an access token is stored – no Personally identifiable information (PII) is stored in your browser. and tries to load player information associated with the logged in user. Curiously, Niantic is using your Facebook/Google/SuperAwesome ID to identify you and lookup your current codename! Once again, you are identified with a token, but this time it’s a Niantic-issued “Bearer Token” stored in the Authorization header of the POST request. This method of relaying user’s request without actually sending your codename is secure, fast and ingenious. We salute Niantic for implementing the reservation securely: there are no passwords, codenames or any other vulnerable information exchanged during the entire process. We’re sorry, we are unable to complete this reservation. You’ve already reserved a Code Name for Harry Potter: Wizards Unite. Apparently, once you claim a codename, you will be able to use any login method currently associated with your account to use it when Wizards Unite launches in your region. Niantic is using industry standards code for authorization, authentication and information transfer. Your current codename / username is safe from hijacking, modifications and overwrites. Despite site saying that you will have to use the same login method once Wizards Unite is available, evidence suggests that any login method associated with your Niantic account will give you access to your reserved codename. Earlier today, Niantic unveiled codename pre-registrations for existing Pokémon GO and Ingress players! 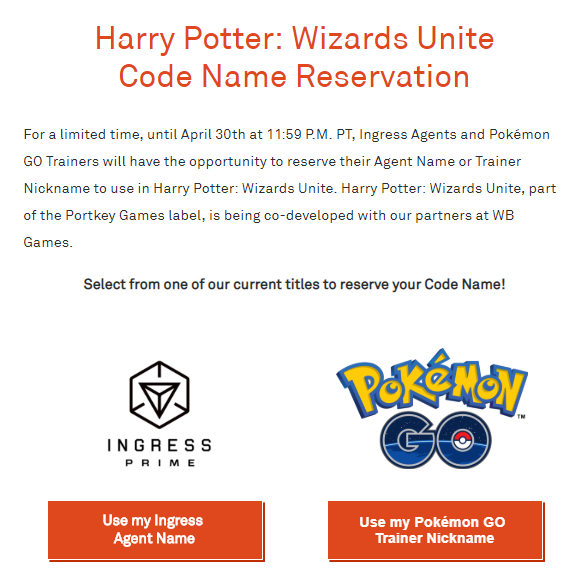 Until April 30th, 2019 at 11:59 P.M. PT, Ingress Agents and Pokémon GO Trainers will be able to reserve their Agent Name or Trainer Nickname to use in Harry Potter: Wizards Unite. Please note that at this time, you can’t reserve a new unique name unless you change your name on Pokemon GO. I know, this is unfortunate for unique witchcraft and wizardry names. However, it’s a start! You should also know that Pokemon Trainer Club accounts don’t work. You will need to link your Trainer Club account with your Google account. There are exceptions, however. There may be some cases where Codename reservations are not guaranteed. For example, your Code Name may overlap with a user in another Niantic title. For this scenario, reservation will be first come, first served. So apply for reservation as soon as you read this news! It’s also possible that if your codename overlaps too much with iconic names in the wizarding world, you won’t be allowed to use it for Wizards Unite. A few WUtubers weren’t able to get their codenames, and it’s unclear if that is because their codenames overlapped with an Ingress player or if their codenames were already too magical. We will update this post if we learn more. Until then, grab your codename ASAP! Reserve your code name here! You can also read our In-depth look at how Wizards Unite codename regservation works for a more technical overview of the reservation system. As always, keep coming back to Wizards Unite Hub for the latest news, wikis, and articles involving Wizards Unite!